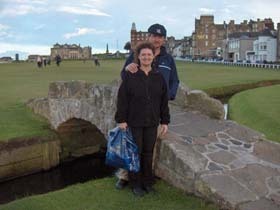 We ended up contacting Golf Vacations UK over the internet after our local travel agency was dragging its feet. Graeme contacted us within one day of getting our email and came up with an awesome itinerary for an unforgettable honeymoon. Five golf courses, accomodations at two castles and a rental vehicle large enough to hold our luggage and golf clubs. It far surpassed our expectations and apart from being a very memorable vacation, it was also extremely hassle-free.